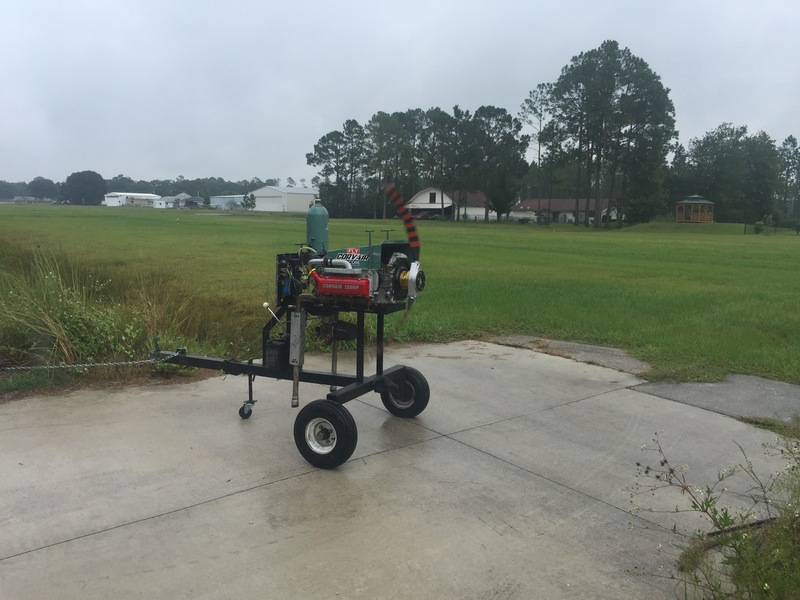 As wind and rain picks up in front of hurricane Mathew, work goes on while we have power. 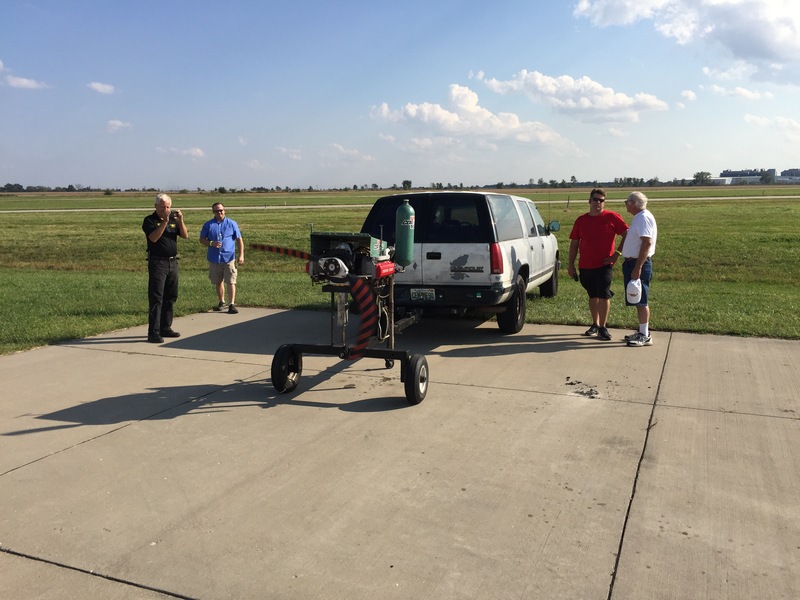 Yesterday this included final test run on the engine we assembled and ran for 40 minutes at the Zenith 25th open house. This engine is a 3,000 cc 120hp engine featuring a Weseman billet made in the USA crank. It was easy to completely build at the Open House because it was one of the Weseman’s “Engine in a Box” complete kits. If you are interested in purchasing this engine, you are too late, it is already sold, but Dan and Rachel have other “Engine in a Box”‘s ready to go. Contact them at 904-626-7777 for more info. Above, the engine on the run stand in front of my hangar. It was raining lightly, but it doesn’t bother a Corvair. During the second run in Florida, the piston ring break in was completed, the oil filter was changed and the first one was cut open and inspected, compression was evaluated and the timing was set with a light, and the adjustable oil pressure regulator setting was fine tuned. It ran like a champ, and then I took it to the SPA/Panther factory for crating and shipping. Above is a short clip of the engine running at 1,500 rpm or so. Eariler at Zenith, Dan briefs observers on what we are going to do. The assembly had about 25 guys who followed every step, and about three times that many they checked in to see how it was done. When we took it outside to run it on Saturday, about 75 people stood there to watch the first fire up. In the hour before, they had heard a Continental 0-200, that was on a flying plane, that was poorly tuned take two minutes of cranking and stuttering to run. Other engines put on a few less than stellar starts. Many of the 75 people, most of who thought that a brand new engine, made of parts that had not yet ‘met each other’, would be difficult to start. I’m sure they thought is was full of it when I said it would start and come to power in 3 seconds. These people were slightly stunned when the motor started, instantly, as in less than one second. Much of this is the ignition system I build being vastly better than a magneto, but it is also knowing the engine, as we teach builders to make and operate it. It is a very different mentality that the person in another cockpit, relentlessly grinding on a starter hoping it will light off. Hope isn’t a mechanical strategy, understanding and performance is. Above, 30 minutes into the test run at Zenith. 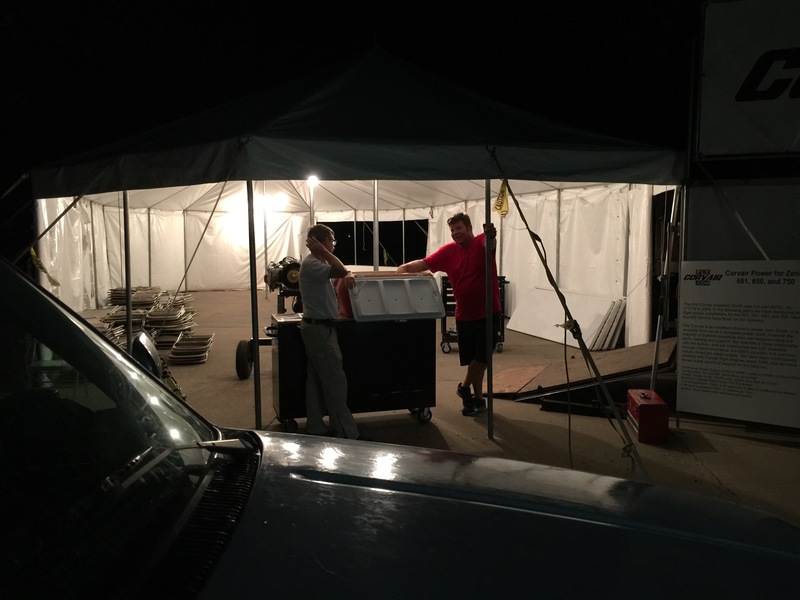 Above, after the show, the EAA’s Charlie Becker speaks with Dan Weseman as we packed up late night on Saturday night. The Conversation was a bit about what had taken place, but much of it is always aimed at the next event, the future, and things that can be put in action. On this night, much of that revolved around the November 3-5th Aviation Showcase in Deland Florida. Dan and I got up at 6am Sunday morning and drove the 1,100 miles back to Jacksonville. In the summer of 1980, I was 17 years old and living in New Jersey. Although we were less than 15 miles from Manhattan, the world wide center of fashion, we all thought there was nothing more stupid than people who were slaves to caring about what others thought of their appearance. We were the total opposite, individuals expressing ourselves, which we chose to do by each and every one of us having long hair, dressing in black tee shirts, Levis 512’s and Timberland boots, while all driving Chevys with cassette decks that all had a copy of “Back in Black” permanently stuck in them. We honestly were oblivious to the idea this was also conformity, but the music endures better than 1980s NYC fashion. It is one of the few elements of teenage years I hold any nostalgia for. Job Offer: Work from home, learn a lot, make up to $400/hr. I will explain the title a little further into the post, but to start, examine the Corvair powered plane below. It is a brand new 3,000 cc Corvair powered SPA Panther, built by Brent Mayo, of Florida. 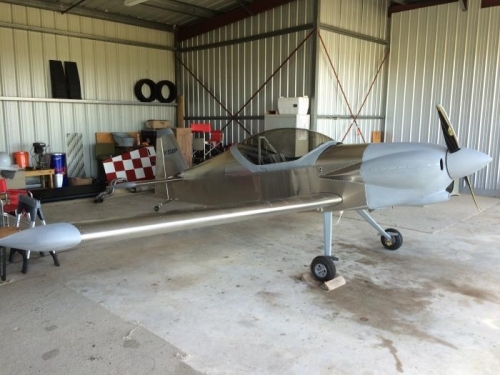 Besides the fact that it is an outstanding example of craftsmanship, read this next part slowly: Brent’s builders log shows that he has a total of only 828 hours of work into the plane, 14 months of build time, and this includes building the whole airframe and the Corvair engine for it, all the way through being ready for his FAA inspection. Rachel Weseman wrote at story about Brent’s plane on the Panther website. You can read it and see a lot of great pictures of the plane at this link, it is the second story down: https://flywithspa.com/category/panther/ Included in Rachel’s story is a link to Brent’s builders log, it is a treasure of information and pictures, and it clearly documents how little time it took him to do each of the tasks, and total hours for different sections. The log is inarguable testimony that both the Panther airframe, and the Corvair engine can be built in a very reasonable amount of time. Above, Brent Mayo’s Panther LS, powered by a 3.000 cc Corvair. It is a done aircraft, awaiting only it’s FAA inspection. 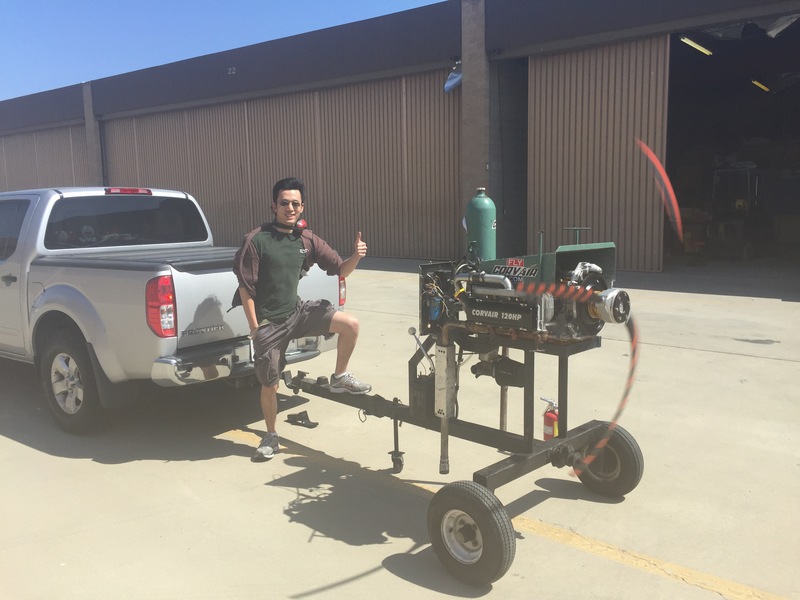 If Brent’s name rings a bell, it is because he was one of the five builders who finished and ran his engine at out first “finishing school” Get a look at this link and spend a few minutes looking at the video of the running engines. Brent’s engine was the first one to run, notice how quickly it starts and runs: Corvair Finishing School #1, Video report. OK, get a look at Brent’s builders log, and see that he has 104 hours under the engine category. Note that this includes installing everything ahead of the firewall. If you break out just the part with is assembling and test running the engine, the hours total only 34 for the assembly and 8 hours more for the test run at the finishing school. Conceding that any engine needs to be mounted, cowled, have a prop and spinner installed and be wired, then selecting a Corvair and building it for his plane only added 42 hours to Brent’s total build time. Over the years I have seen plenty of magazine articles saying that “choosing and alternative engine adds a year at least to your build.” While that might be so for a poorly supported engine that has never been mated to a particular airframe, it clearly doesn’t apply to the Corvair or installing on the Panther, or the other airframes we have long ago proven it on and support with installation components. The reality is that the decision to use the Corvair, and build it himself, didn’t cost Brent any significant amount of time in his build. 42 hours is less than 6% of the total of 828 hours invested in the whole plane. But stop and think for a moment, that a Panther is one of the fastest planes on the market to build. There are plenty of other good planes out there, but many of them take more than 2,000 hours to build. If you built the same 42 hour Corvair for a plans built fabric covered plane that took 2,000 hours to build, the engine would constitute just 2% of the build time. So much for the “traditional wisdom of experts” who speak on line and at EAA meetings. But lets stop and consider what a builder gets who decides to invest 42 hours gets for his time. First, he knows the engine far better than any guy who just buys some imported engine in a box and bolts it on. Second, there is a great satisfaction in building your own engine. I have shaken the hand of 300 builders a moment after their engine started on my stand. You can literally feel a builders pride in their grasp at that moment, it is a genuine, and it is a moment that doesn’t happen for people who buy engines. These are the two best reasons for any builder to select a Corvair. A third reason is the title of this story: Consider for a moment, that Brent’s engine is an absolute first class engine that utilizes nearly every part in in the FlyCorvair and SPA/Panther catalog of parts. I am pretty sure it has more than $10K in parts in it. The next least expensive engine option is probably a Jabaru 3300, and because of exchange rates that engine is actually down in price, near $18K. Rotax and others are north of there, up to the UL-350 somewhere around $30K. They are all reasonably good engines, but just looking at the price vs the 42 hours, Brent saved between $100 and $400 per hour he invested in his Corvair build. BTW, the 42 hours isn’t a record. 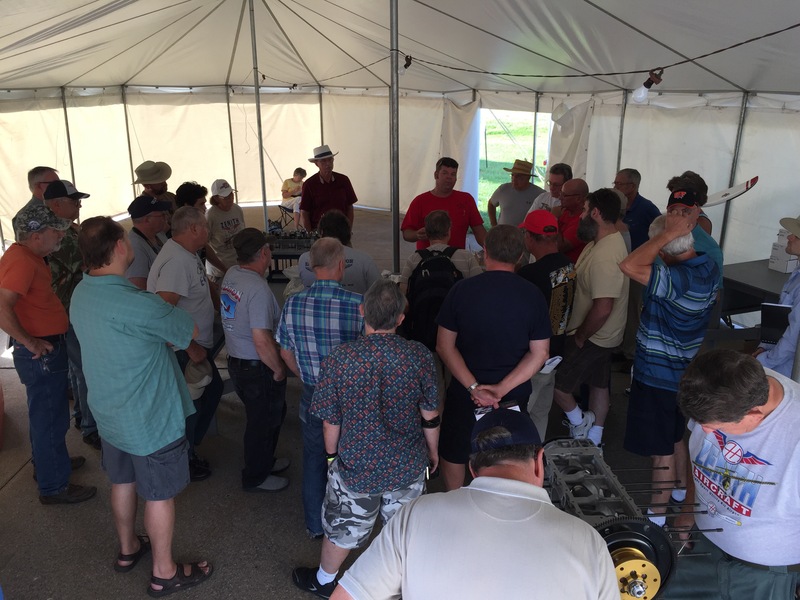 We have a number of people each year that come well prepped to Corvair Colleges, and fully assemble and test run engines in a two and a half day event. Before anyone remotely suggests such engines don’t involve learning or are less than perfect, let me say that I have seen these engines built and run, they are first class, and I was there when they were assembled and can attest that these guys were motivated to do their homework and learned a lot. Open minded people with a plan happen to write a lot of success stories in experimental aviation. Before anyone gets too upset or comes back with other calculations or alternatives, let me flat out say that people should use/buy/build which ever engine they like, and it has always been my policy that Corvairs are not for everyone, and I don’t portray them as such, I just say they are a very good option for the right builder. I have owned, built and flown behind many different engines, there are reasons for the right builder to own any of them. The whole purpose of the story is just to illustrate that you can build a Corvair is a short number of hours, it isn’t a significant portion of the total build hours, even on a really quick building plane like a Panther, in comparison to other popular engines it is economical, even when you select the highest end build, and the biggie, that there is a lot to be said for the learning and accomplishment of building an engine yourself. There is nothing wrong with a guy who has had a Corvair in his shop for years, and he enjoys tinkering with it. Building the motor isn’t a contest, it is a group of choices and actions that are supposed to teach you things and provide satisfaction when looking at the completed engine. But know this: I have seen countless guys spend years on internet discussion groups, following people who counsel making all manner of starters, hokey oil systems, and poorly thought out parts, all with the goal of making something ‘unique’ or saving some bucks. Even if that crap worked as well as the stuff we sell and teach people to use, (which it doesn’t) I can still make the case that it is a poor use of your life to spend five years making parts, when better stuff is available that bolts right together in 42 hours, proven systems you can trust. There is nothing ‘unique’ about making one off poorly thought out parts and finding out they cost nearly as much as our stuff, but discovering they don’t fit on your plane, you don’t trust them. This isn’t “unique” at all, people waste years of time and thousands of dollars doing this all the time. Want to do something that will set you apart? Make some smart choices, use proven stuff, build it according to our methods, and go out and enjoy it. In a world of people letting years slide by, deciding that you will not let that happen to you is a unique decision. 2.8 hours a day is 1022 hours a year. That is far more time than Brent spent building is whole airplane. At that rate, it would have only taken him 15 days of TV watching to finish his engine. Is there really anything you saw on TV in the last to weeks that would make you feel like Brent did when his engine fired up? from: Thought for the Day: Time…..Your enemy. 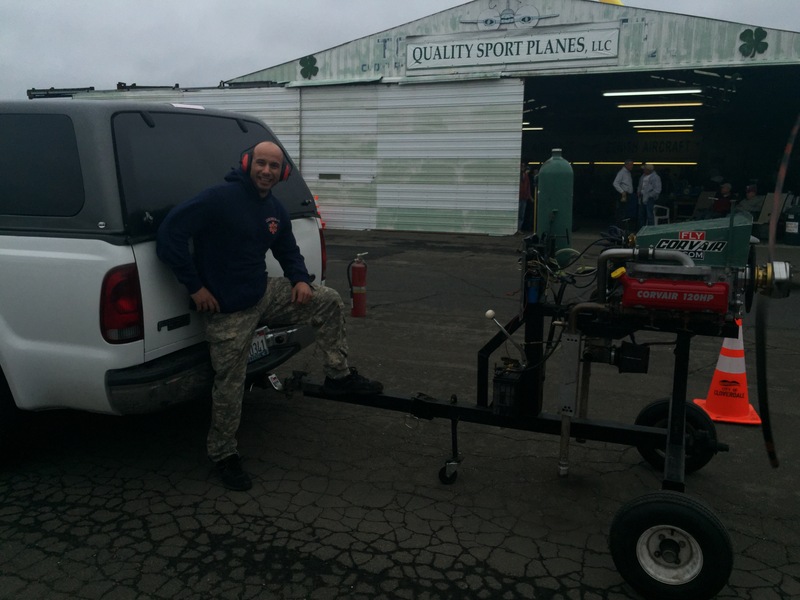 Vision builder Alan Laudani fired up his 3,000 cc Covair on Sunday at 10:00 am, and put down the last run of CC #38. It started in a few seconds of cranking, and ran straight through a perfect break in run. 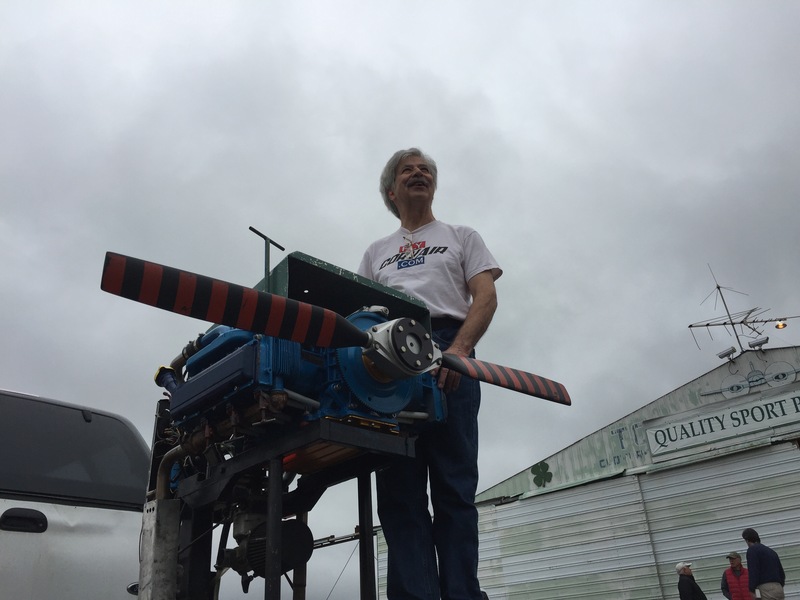 Above, Alan standing beside his engine just before the run. The featured engine today is the 3,000 cc Corvair for his Sonex. I laid down its first test run today. It fired right up and ran perfect during the full break in run. Above , a short film of the engine running at 2,200 rpm. Some of the most frequently asked questions are about storing a completed engines. The following notes cover these topics. The last engine run at Corvair College #21 at Barnwell SC belonged to Robert Caldwell who came all the way from Texas with his lovely wife Barbara. This engine’s long block was completed more than 10 years earlier at CC#2. It started and ran perfectly. It was a nice moment, it was also Roberts birthday. How long can an engine sit after it was assembled without being damaged? Indefinitely, as long as it is protected from moisture and corrosion. Look at the engine above, proof that your Corvair is great, but it isn’t capable of understanding calendar time. If it is stored properly, it would have no issue waiting 50 years to be started. If we do a break in run on my engine at a college, do we have to treat it with preservatives or something before it gets stored? No, this isn’t an issue. At Colleges, we run engines on unleaded fuel for a very specific reason: The byproducts of the combustion of Avgas are corrosive in the presence of moisture. If you run an engine on 100LL and then store it in a less than dry atmosphere, it will attack the combustion chambers and seats. Unleaded auto fuel does not do this. During the break in run we keep the oil temp way above the boiling point of water, and it boils out the entrained water, and coats the inside with oil. If it gets sealed up as it is cooling off, the engine is set to be stored, as is. I do not drain the oil. If I cut open the filter, I replace it with another, or seal it with a small plastic bag. What about ‘Fogging’ the engine like people do with outboards in the fall? Not required. Because many outboards have open exhausts in the lower end that lead right to the cylinder bores, fogging is a good idea, but you are not going to keep your Corvair outside like most boats are kept over the winter. Outboards face condensation issues even if you wrap them with tarps. I have fogged Corvairs in the past, but I do have some question about the compatibility of our rings with fogging, and since there isn’t a need for it, we don’t do it. What about dehydrator plugs? You don’t need them. They are a good idea on aircraft engines which are still stored on the airframe, but you are not doing this, you are putting your masterpiece indoors. What is the right way to store it? First, put four ‘feet’ on it, these are made from four 1/2″ x 4″ carriage bolts and eight 1/2″x13 coarse thread nuts. You put these through the four mounting points in the bottom of the case, and they prevent the weight of the engine from sitting on the pan. Then tape off the six exhaust ports, the two intake tubes, and the two breather ports. Seal up all the oil ports and the filter area. Put the entire motor in a very thick (8mill) Clear plastic bag. Catch why the bag has to be clear: Just before you close the bag, you put in a 4″x 4″ piece of mild steel sheet, completely stripped of all finish, either sand blasted or wire wheeled clean and bare. You put this on top of the engine, in the bag, where you can see it at a glance walking by. This way, six months later, if you notice that the plate has rust forming on it, you know you need to reseal the bag, move the engine or both. If the bag is a dark color, you will not be able to see it until it is too late. Even though this makes a lot of sense, I have done it this way since before the first Gulf War, many people will just wrap it up in a blue tarp and put it in the pool shed, because their better half didn’t like the idea of putting it under the glass coffee table top in the living room. On the day that was going to be the glorious moment where the pristine test run masterpiece was to be unveiled and mounted on the equally magnificent airframe of craftsmanship, and Horrors! some evil-doer has taken your tribute Tonawanda and replaced it with a rusty, corroded artifact from Robert Ballard’s warehouse! Don’t let this happen to you. Store your masterpiece properly.